If you are backpacking then you have very different needs than if you were at a static camp. In that situation you would just focus on comfort but with backpacking there is also weight and ease of use to consider too. Choosing the best backpacking sleeping bag isn’t the easiest task. It often means looking for the best ultralight sleeping bag and trying to find that balance between weight and comfort, which is often a delicate one. After that there are other features to think about too such as the insulation that it is able to provide and its design type. We have picked through all of these features in our buying guide so you can be fully confident in what you are buying. On top of that, we have also completed backpacking sleeping bag reviews on the ten best products on the market to help you to choose the perfect one for you. This is a top rated ultralight sleeping bag from Teton Sports which ticks all the boxes when it comes to the perfect sleeping bag for backpacking. It’s available with a heat rating of either +20F or +0F depending on the conditions you’ll be in. It’s ultralight in weight but still able to give a very good level of insulation with thicker parts in key areas. The three-piece hood is able to contour around your head in order to keep your whole head warm throughout your sleep. It has a breathable and soft interior liner for added comfort and has a ripstop shell which is going to be resistant to tears and the bag is resistant to water too. Another great feature is an interior pocket where you’ll be able to keep your valuable items. This is a compact sleeping bag which is going to be very easy to carry around on your backpacking adventures. It comes in a variety of different colors depending on your style and they come with a temperature rating of either +25F or +35F. The shell is water resistant and the lining is soft and comfortable which should ensure that you are able to get a brilliant night of sleep. It features highly durable zippers so you should be able to use your sleeping bag with confidence knowing that it’s not going to let you down. 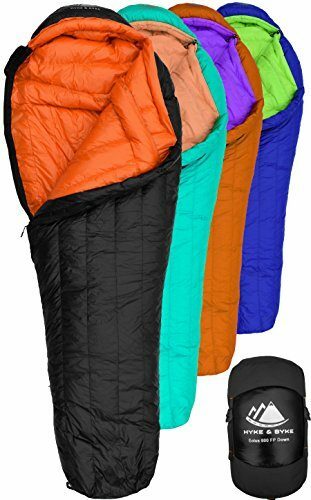 The sleeping bag is very lightweight and portable as it’s able to fold down to a very small size and only weighs three pounds, so it will be easy to carry around with you wherever you go. It’s a bag that is going to give you a great night’s sleep even when the temperature starts to cool. This lightweight sleeping bag from Outdoorsman Lab is one of the best products on the market. Due to the light material it doesn’t have the lowest temperature rating but should still give you a good night of sleep in temperatures of 38F an above. The bag only weighs three pounds but perhaps more impressive is the size that it packs down to as it will be 15 inches by 6.5, which will make it very portable to wherever you wanted to go. It has a great zipper system as well as an integrated pillowcase if you wanted a more comfortable sleep. The sleeping bag is very comfortable as the liner will be very soft on your skin but the outer shell is able to resist tears and water. A lifetime warranty is offered on the bag so you know that you’ll be getting a quality product and one which will last for a long time. 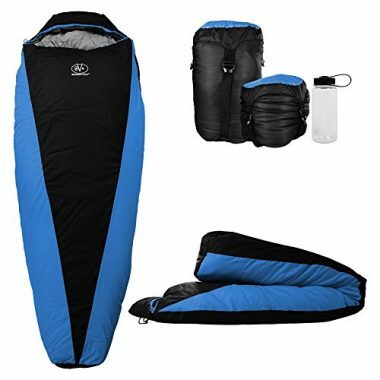 Kelty have produced a sleeping bag which comes in two sizes of either regular or long which gives you an option for a comfortable sleeping bag if you are a little taller. The bag is very highly rated and you know that you’ll be getting a top quality product which will last you for a long time. It has a rating of 22F which makes it ideal for those who are looking to camp for three seasons out of the year. The sleeping bag is designed that it will be able to retain your body heat to allow you to stay comfortable throughout the whole of the night. 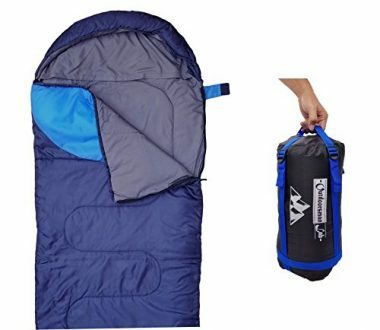 The sleeping bag has a hood which will give you a snug fit and a natural fit foot box too, the zipper has an anti-snag design which is another great feature. A stuff sack is included so it is able to compact to a small size and the bag weighs just three pounds. Hyke & Byke have been able to produce a great down sleeping bag which is going to be able to give you a huge level of comfort. It’s available in a range of different colors and also has a great level of insulation as it will as it will still insulate you in 15F. Despite that great level of insulation the bag only weighs around three pounds depending on whether you get it in short, regular or long. A lifetime warranty is offered on the product and it is highly rated too, giving you confidence that you are getting a quality product. It features a water-repellent ripstop nylon shell which will ensure that the bag doesn’t tear and gives it a great level of durability. It comes with a stuff sack which will be able to compress your bag down to a small size which will make it very easy to carry. This is another great product from Hyke & Byke but one which uses a goose down filling instead of a duck down filling. That filling will mean that the bag is able to stay very light while still providing great insulation, their short 30F bags actually weigh under two pounds. Due to that weight, the bag is able to pack down to a very small size which makes it ideal for backpacking. It’s also very durable too and comes with a lifetime warranty, partly due to the fact that it is made out of ripstop nylon so you know it will take a lot of punishment. The bag has wide shoulders and a large foot box which will be able to accommodate everyone and give you a very high level of comfort. 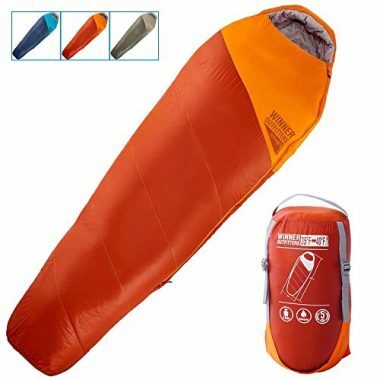 Overall this is a brilliant sleeping bag which is ideal for those looking for a high level of insulation and but with a little amount of weight. This is another product from Hyke & Byke and another which has goose down filling but this is a bag which is going to be ideal for cold weather camping as it contains a lot of insulation which means that it has a temperature rating of a very impressive 0F. That will mean that it is slightly heavier than other Hyke & Byke sleeping bags but it is still comparable with plenty of other companies, as they will still weigh just around three pounds due to that goose down filling, which is an incredible natural insulator. This is another bag which is going to be highly durable with that ripstop nylon and another which comes highly rated. The inside liner will be able to give you a high level of comfort to ensure that you are able to have a great night of sleep time and time again. This sleeping bag from Outdoorsman Lab is going to be ideal for those who are backpacking in the three warmest seasons of the year, when the temperature is a little warmer. The bag has a lower comfort rating of 29F which means it will still be able to perform well when the temperature drops. It weighs just three pounds and compacts down to a small size which makes it easily transportable. The bag is machine washable and easy to clean with a ripstop shell which is waterproof and able to give you a high amount of durability. The bag is able to give you a plenty of room despite its mummy shape and has plenty of features which can help to have a great night of sleep, including an integrated pillowcase. It’s able to fit anyone up to the size of 6’ 3” and is available in either blue coloring or orange. This is a stylish looking bag which is available in either a blue or orange color, which both look great. The bag will be able to keep you very warm at 35F which makes it ideal for three seasons camping and it weighs just over two pounds, therefore it is highly portable too. One of the best features about this bag is the microfiber nature of it which means that it is able to compress down to a very small size which only adds to the ease of use of the product. It can zip together with another sleeping bag too for added warmth and comfort if you have a partner. The bag is very durable and easy to wash too with a limited lifetime warranty should there be any defects within the bag. This is a bag which is very light in weight and easy to use which is ideal for those who have a limited amount of space. 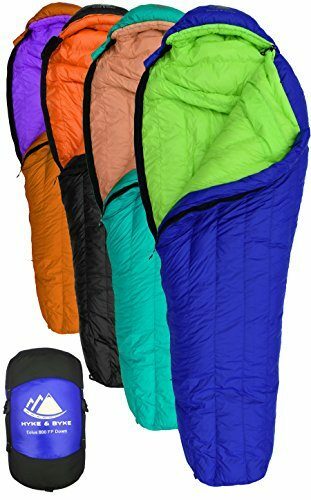 If you’re looking for a packable sleeping bag then this is going to be a great product for you as it is ultralight and able to be compacted down to a very small size. It weighs just under three pounds despite being able to give you an impressive warmth rating of 20F. It’s has a diamond ripstop shell so you know that it is going to be highly durable and able to last for a very long time. It has draft tubes to stop any breeze coming into your bag and also features an interior pocket which is always a useful feature. The soft and breathable line will enable you to have a very comfortable night of sleep every time which is helped by the drawstring cord to keep your head warm. You are able to stuff the bag and be on your way very quickly the next morning. When it comes to insulation there are two main options that you can have which are both highly effective for different reasons. In the past they were very different but modern advances have meant that the disadvantages of both options are now much less than they used to be, and there can also be a hybrid of the two types. Down – Down are the tiny feathers that keep birds insulated next to their skin and in terms of sleeping bags, will be either from duck or goose. It is still seen as the preferred insulation type by many, especially those who are looking to reduce weight as down provides a very high level of insulation in proportion to its mass. One negative of down in the past was that it wasn’t very water resistant but the water-resistant shells that you can now get and the chemical treatments that can be added to down stop this from being a problem. It is still worse for allergies, however, which is important to check. Down though is extremely comfortable and seen as a better material, which makes it unsurprisingly more expensive. Synthetic – Synthetic materials can still provide you with a lot of warmth which is why they remain a very popular choice for many. It is very durable which is less of a concern if you have a high-quality shell but is also better for allergies, which is important if that is a concern for you. As mentioned before, these two materials are using the other as inspiration to become better and more alike, and synthetic materials have done this by using much smaller fibers which give them a weight and a packability which is similar to down. If you are going to be in wet conditions then synthetic is still going to be the sleeping bag of choice and synthetic also has the added advantage of being cheaper. Hybrid – Increasingly you are seeing hybrids that are on the market which contain both synthetic and down insulation. While these try to give you the best of both worlds in terms of feel and durability, it also means that you have both disadvantages too in terms of price, allergies, weight and water resistance. The temperature rating is going to be a crucial part of your buying decision as you want to ensure that you are going to be comfortable when you sleep. While it may feel like a natural instinct to look for a bag which is able to give you the warmest, and therefore lowest, rating possible, there’s definitely a lot more to it than that. 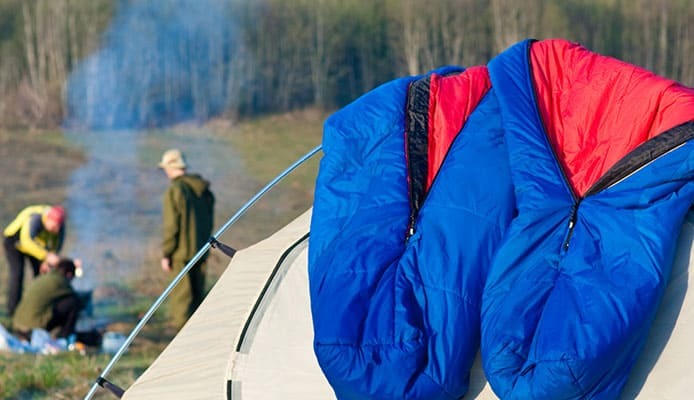 As much as no-one wants to sleep in the cold, you also don’t want to be too hot either and this would be a big problem if you’re sleeping in the summer with a heavily insulated bag. The rating is generally given by an independent source and two ratings are given of a ‘lower’ rating (the lowest temperature that it’s possible to sleep in) and a ‘comfort’ rating (the ideal lowest temperature) so it’s important to check which one is listed. In the winter you would probably want a rating of between 0 and 15F, for a three season bag between 15 and 30F and for summer between 30 to 45F but this naturally can depend on the climate of where you intend to be backpacking. You always have the option of getting a sleeping bag liner if you wanted to add a layer of insulation to your existing bag. The typical shape of a sleeping bag is the rectangle that we have seen for so long but in terms of camping this would be bulkier than other options and there is also more air in there to heat up, so they aren’t able to offer the same level of insulation as other options. 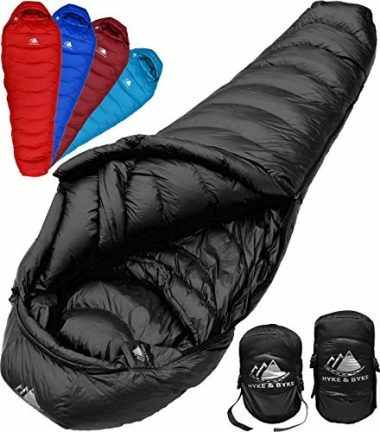 In terms of backpacking weight and packability become very big issues and you would probably be willing to swap the extra room that you would get from a larger sleeping bag in order to have something which is going to weigh less and also be less portable, which is why mummy sleeping bags would be the preferred option. Mummy sleeping bags also have a lot less room inside which might not be to everyone’s tastes but it does mean that it’s able to warm up very quickly and more likely to keep you insulated. There is often a drawcord on the hook too which will stop any cold air from coming in. In terms of fit and shape, a mummy sleeping bag is going to be the best option for backpacking. In terms of backpacking, weight and packability are vitally important as you have plenty of gear that you need to take and you want to be able to get it all into your backpack without it being too heavy. These two go hand in hand too as you would need to have both in order to be as comfortable as possible. This is where getting down insulation can be ideal as it gives to the best insulation to weight ratio meaning that you can have a warmer night of sleep in a bag which weighs very little. Having a bag which weighs three pounds or less is going to be ideal and you want it to compress down into a small size. 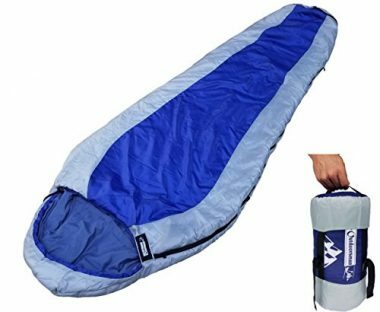 There are a few additional features that can come with these sleeping bags with the zips playing an important role. In order to save weight, more bags are opting to have no zip at all while others may have a half zip or one across the foot box if you get too warm. It’s important to get a sleeping bag with a hood in order to give you the level of insulation that you are looking for and it can often come with an in-built pillowcase too for extra comfort. Some bags come with draft tubes over the zip to stop any cold airflow which is another useful feature. Another very useful feature to have is an internal pocket on the sleeping bag where you will be able to store your valuable items. While in order to be a great backpacking bag it needs to be light and portable, you still want to be able to sleep in comfort so it’s a very important consideration when it comes to these sleeping bags. Even with a mummy bag you want to ensure that you have enough room to move around so getting a bag which is going to match your dimensions is important. You also want to consider the way that you sleep as well. Some people like to sleep on their stomachs and this is one instance where a hood wouldn’t really be suitable. In terms of material, down is seen as better as it is more breathable and you want to ensure that the lining is soft and able to give you a comfortable night of sleep. Ideally if you are buying a sleeping bag then you don’t want to just be able to use it in one specific set of conditions unless you have the money to be able to buy a bag for each season. You need to think about the conditions that you are in and then you would be able to get a sleeping bag which is going to match them. It might seem wise to make sure that you are going to be warm enough when you are sleeping and opt for one with a lower temperature rating but actually you can add layers from elsewhere but you can’t take them away. Getting a thinner bag and taking extra layers when it’s colder might be the best way to get versatility from your bag. The construction of your bag is going to be important in making sure that you have comfort and durability. It’s always a good idea to get one which is highly rated from a reputable source and one which comes with a warranty so you know you’ll be covered if anything is wrong with the bag. The zips and seams need to be sturdy and you want to make sure that the insulation is going to be evenly distributed throughout the bag so you don’t have any cold spots and this is usually done by having baffles, which are separate segments to stop the insulation moving around. 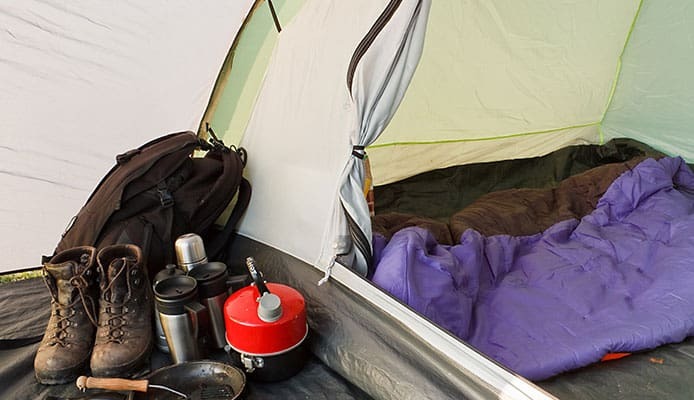 Q: What Is The Difference Between A Regular Camping Sleeping Bag And Backpacking Sleeping Bag? A: There are a few things that a backpacking sleeping bag needs to be in order to make it ideal for the job with probably the most important one being weight. You need to make sure that it is light enough to be able to take with you on hikes. It also needs to pack down into a very small size which is why they usually come in a mummy shape to cut down on the material. A backpacking bag also needs to offer you the right amount of insulation in what may be colder conditions in an ultralight tent. Q: How To Store My Sleeping Bag When I am Not Using It? A: While this might be an inconvenience, it’s probably the best idea to store your sleeping bag outside of the compressing bag in order to not compact the insulation together, which might affect its ability over time. The crucial aspect though is that you want to make sure that you are keeping it dry in order to prevent any mildew or bacteria from forming. Storing it in a drafty and damp garage, for example, isn’t going to be the best idea. Q: What Is The Recommended Weight Of A Sleeping Bag? A: The ideal weight for a backpacking sleeping bag can depend on a number of different aspects such as your size and the distance you will travel. Taller people will need bigger bags and therefore they would most likely weight more. Also bags with more insulation are going to weigh more too with the additional fibers that are added. For a regular sized bag, with a mid-range temperature rating, anything around three pounds would be ideal, anything under that would be a bonus. In order to enjoy your backpacking experience you want to make sure that you have equipment which isn’t going to weigh you down and be too heavy so you are able to enjoy it without worrying too much about the weight that you have to carry. 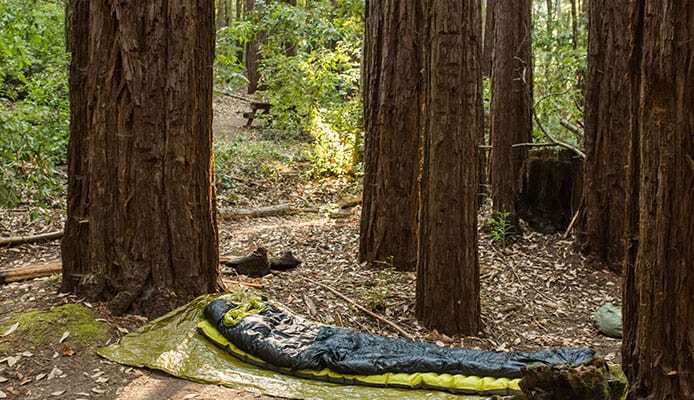 Getting a high-quality and light sleeping bag is an important part of that, as it is a significant part of the gear that you will be taking on your trip. Not only do you want to make sure that it’s light but you want it to be as portable as possible and compress down to a small size. After that then other features are going to be important as you still want to make sure that you are having a comfortable night of sleep with a liner which is going to feel soft next to your skin and enough insulation so that you are not going to get too cold or too hot. While other types of bag are available, a mummy style bag is going to be the best for backpacking as it is the lightest, most compact and warmest type. Once you know what weight and insulation you want, then you can look to see if there are any additional features which might appeal to you. Hopefully this guide has been able to answer all your questions on what you should be looking for when it comes to a backpacking sleeping bag. Once you have the perfect one for you then you will be able to have a more comfortable night of sleep than ever, with a bag which won’t weigh you down when you’re backpacking.